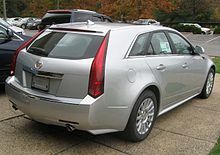 Cadillac CTS is a mid-size luxury vehicle that is manufactured by Cadillac; the vehicle is available in three body styles: station wagon, coupe or sedan. The vehicle was introduced in early 2002 as a 2003 model. It entered its second generation in late 2007 as a 2008 model, coupe and wagon versions were added later in the run. The current third generation model arrived in late 2013 as a 2014 model. This page was last changed on 6 April 2017, at 00:49.